With the Inkscape 0.92pre2 15127 snapshot from the Inkscape Website, using Edit User Preferences > Interface > Keyboard Shortcuts > Export causes inkscape 0.92 to crash. Either immediately after pressing escape, or some times a few 'ghost windows' pop up. 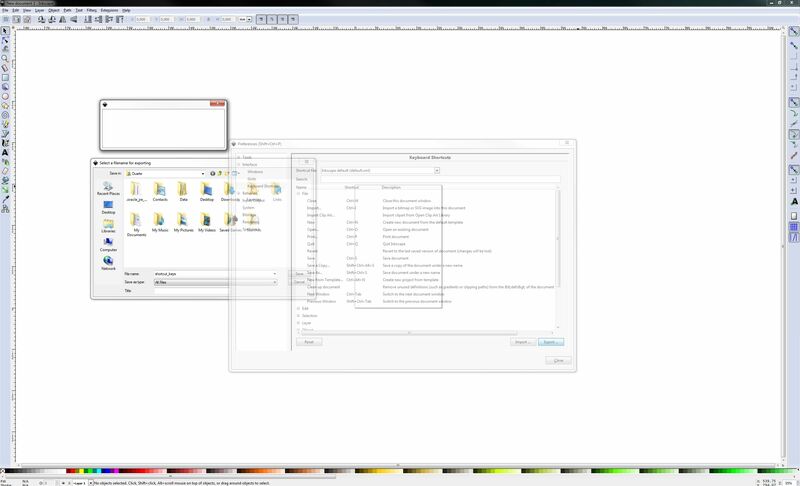 One can't see the content of the window nor the right-click menu, but copy-pasting the text reveals the window is showing a "Inkscape encountered an internal error and will close now." hidden message. It will let you browse for a location and save there, but the file is never created, and closing the lingering window will make Inkscape finally force-quit. I am using the snapshot from the Inkscape Gallery Inkscape 0.92pre2 15127, under Windows 7 64 bits. Not reproduced on Xubuntu 16.04, lp:inkscape rev. 15219 and lp:inkscape/0.92.x rev. 15155. Not reproduced on Windows XP (32-bit) with lp:inkscape/0.92.x rev. 15155. The fact that no file is created seems to be caused by there being no changes in the default keyboard shortcut file, thought the crash still seems to be unwanted behavior. Tested again a bit further it it was caused by having portable settings defined with `SET INKSCAPE_PORTABLE_PROFILE_DIR=.\Settings` but no change starting directly from the exe. The crash is not consistent, if you notice on the attached GIF, it only happpens from time to time. When it doesn't Inkscape UI becomes unfocused or unresponsive and has to be minimized and maximized to be usable again. After a few exports attempts it will eventually crash. If you notice in the attached gif there is also a weird blank window floating above the preferences window whenever it is unfocused, though it is a minor glitch and probably unrelated to the crash. @Alvin, I can confirm the failure to produce the output file when exporting an unchanged keymap. If you modify a key assignment, a local file is created and then correctly exported (with the local changes only, not the whole keymap). But I'm not sure it's the same issue Duarte reported. Issue confirmed in Inkscape 0.92.1 Inkscape 0.92.1 r15371 (64-bit) as well as current master. The issue happens when using the *native file dialog* on Windows. With the gtk dialog I can export just fine. OK, source found (it's in src/shortcuts.cpp): "saveDialog->addFileType("All Files", "*");"
Looking forward to a new build.